Well first, I don`t know if any of you know my poker story but here goes. I was at my parents house one day for some family get together (thanksgiving, bday or something like that not sure) and my dad and brother were watching the WPT on tv. I even made the comment "Who would watch POKER on tv??" and that was the beginning of my obsession. I started to play on poker sites online a few months after that when my brother showed me you could play online for PLAY MONEY! How fun was that! Thats actually how I found FTP because it was one of the only sites where my brother and I could play at the same table from the same IP. Although I loved playing the game, I was still my cheap ol self and couldn`t get up the guts to make a real money deposit. My birthday was coming around (May 2005) and I had asked for money to go down to one of the casino boats on the Ohio river. I`d been playing play money for quite some time by then and thought I was a real pro ya know. I lost all my money playing a "fixed" 5/10 game, which btw I hadnt even heard of, much less played at the time. I had $2 left and stuck it in a slot machine and ended up w $56, just enough to make my first FTP deposit! So I left a happy camper and that was all she wrote, until last week, over a year later, and although Ive withdrawn close to $400 since, my actual bankroll online is gone. It was a sad state of affairs, but I`ve just been running HORRID. So, Ill take it as a sign, take a break. A break doesn`t sound all that bad after running bad for about 6 months. Especially when my 150 seat GTD is this Sunday on PS. Last thing I want while playing in this is built up frustration for poker. I mean this is the big one. $350 buy in (which I won of coz) into a tournament that has 150 WSOP Main Event seats guaranteed! Biggest buy in/tournament Ive ever played, thats for certain. And I expect you ALL to be there btw. Keep me from donking off. And EWWWW already over 2k ppl registered! 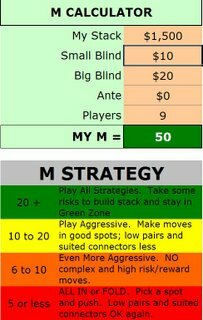 Also, a poker friend from the forum sent me this M Calculator (credit to Zerbet, even if he does spell Zerbert wrong). It is a pretty cool xls spreadsheet you can enter your stats into and get some basic/solid advice, which we all tend to forget at times. 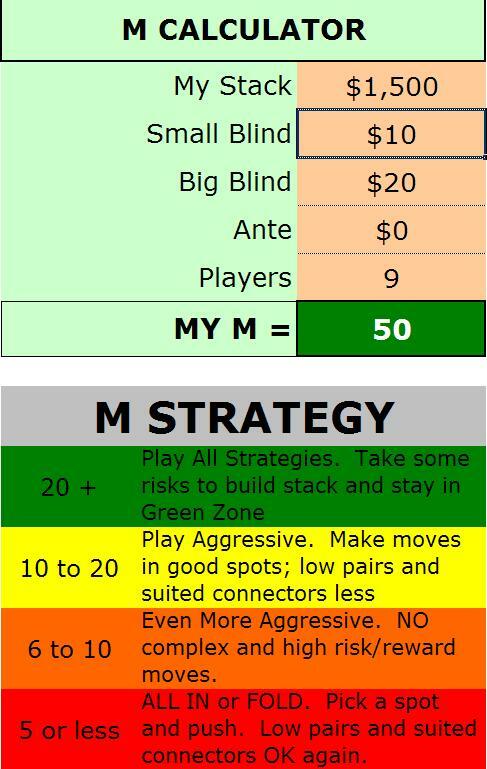 I plan to use this Sunday, especially in the later stages of the tournament, which is where my skills lack a bit in MTTs. You can click the link above and get it for yourself! And like I said, altho it is elementary, it is a very good reminder to play a solid game. Last but not least... I have a home game with some poker peeps tomorrow night. During our Charity Tournament for Rich and Jill, we made a new effer, dlpimpin. He brought quite a few new people to the forum, including smboatdrinks. Turns out they all live in the same town as IlliniFan! Which is about 30 mins from me and if you read my blog you know I have played a home game at IFs before as well. 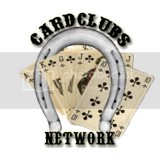 Now smboatdrinks is having a home game tournament, first is a $10 HORSE, which Im sure to donk out of and second a $10 NLHE. Dave and I are going tomorrow. He has alot of people that play on FTP show up for his game so Im excited for a good game. I will definitely let you all know how it goes! Thanks to IlliniFan, Steeler and Squib for the extra stud and stud8 lessons this week to keep me from being a total donk tomorrow. Well, we hope anyhow! Bill Cosby says zerbet, so I say Zerbet. And nice job in the challenge HORSE session last night, madam.